“If you’re passionate about a cause, an event, something in your life that has had a profound impact on you, you should try to see if there’s a good research agenda to that,” said Campus GIS Coordinator Yoh Kawano, when asked to give his best piece of advice to young researchers beginning their careers. Kawano has undoubtedly followed his own guidance. A native of Japan, Kawano was deeply and personally affected by the Great Tohoku Earthquake, which struck his homeland in 2011. After the disaster, Kawano shifted his research focus to the East Asian island nation he calls home. He began investigating how Japanese citizens utilized social media to cope with the crisis and retrieve critical information. He was also inspired to jump on board a research project initiated by Niigata University to monitor radiation levels in the area impacted by the nuclear disaster at the Fukushima Daiichi Power Plant. “At the time of the earthquake, I had been part of a digital humanities team that was researching Twitter and its effect on humanity in general,” said Kawano. In the immediate aftermath of the catastrophe, Kawano diverted his attention to Japan and studied how Japanese citizens were using social media to deal with the tragic situation. Kawano and his research team archived hundreds of thousands of tweets from Japan, carefully analyzed the textual data and did things like sentiment detection. “We were interested in measuring and understanding people’s reactions to the disaster. Are people angry, still in fear, or is there some level of happiness within the crisis? Things like that were of interest to me,” remarked Kawano. Kawano’s work in Japan attracted the attention of event organizers who were planning the inaugural TEDx summit at UCLA. “I was asked to speak at TEDx almost immediately after the disasters in Japan – in May or June of 2011, and the disasters had happened in March,” said Kawano. In his talk, Kawano discussed how the earthquake disrupted several common channels of communication, leading individuals to turn to alternative outlets like Twitter and Facebook. “Cell phone towers shut down and phone lines were completely jammed. But Wi-Fi remained somewhat intact, so people could update social media and access important information,” he explained. At the TEDx event, Kawano also talked about how locational technologies on mobile phones, in combination with social media platforms like Twitter, have the potential to be life-saving tools in times of crisis. “Currently we have 911 for the phone, but not a 911 for Twitter. If, in an emergency, the right people are listening for the correct hashtag, for example #UCLA911, then the UCPD can be looking for that hashtag and respond to the crisis,” said Kawano. “You could also geo-tag the Tweet so that, if law enforcement or emergency relief comes, they have a general idea of where you are.” Organizations like FEMA have already started using social media as a channel to update the public about emergencies and natural disasters. If Kawano’s idea is put into action, thousands of lives could potentially be saved. Since speaking at TEDx, Kawano has continued to advocate the use of Twitter as an instrument for disaster relief and emergency response. A few months ago he traveled to Cal Poly University – San Luis Obispo, where he spoke more about his research and asked students to participate in a unique, crowd-sourced experiment to leverage Twitter in the aftermath of a disaster. “I simulated a disaster happening at the Diablo Canyon Power Plant, which is located near Avila Beach and San Luis Obispo. If an earthquake were to happen, potentially the same thing that happened in Japan could happen on the west coast of California,” said Kawano. He then asked Cal Poly students to pretend that they were in charge of relaying information about the disaster to the public through Twitter. Using a web-based app developed by Kawano, students updated people in their community about the simulated earthquake and nuclear disaster using specific hashtags, and the information was mapped in real-time. In addition to researching how social media can be used for crisis management and coping, Kawano has been actively involved in on-the-ground disaster relief efforts in Japan. Since the powerful 9.0 earthquake hit Japan, Kawano has made several trips back to his homeland. On his first post-disaster visit in December 2011, Kawano explored Sendai, the largest city in the Tohoku area. When he returned in 2012, he joined three researchers from Niigata University and visited the area affected by the nuclear disaster to measure radiation levels. “We visited the evacuation zone, which has been shut off from public access because it’s deemed too dangerous to inhabit. It’s a 20 km zone around the nuclear power plant,” remarked Kawano. He likened the area impacted by the nuclear disaster to a time capsule. Unlike Sendai, which has undergone massive reconstruction, the evacuated zone has remained virtually untouched since the time of the explosions. The Niigata team, called “Bishamon,” has been measuring radiation since the fall of 2011 using a device created by Niigata University’s Radioisotope Center. “[Bishamon] is a group of volunteers from many different expert fields; there are nuclear scientists, agronomists, computer scientists, engineers [and] medical doctors,” explained Kawano. “One of their main missions is standardizing the equipment and the readings of radiation so that measurements are consistent over time.” The research team ultimately hopes to empower local Japanese governments by providing them with the necessary tools and information to measure radiation levels completely on their own. To achieve this goal, Bishamon has done extensive outreach to formulate partnerships with local governments in cities affected by the nuclear disaster. “They went to the city halls, created and established relationships with city officials, and transferred the technology to them. They trained them and worked with them on almost a weekly basis,” said Kawano. “They also prioritized the safety of children. They partnered with, for example, the Departments of Education of [impacted] cities, they regularly measured schools … Their number one priority is the children, since kids are such a vulnerable population.” Once local government representatives are able to independently monitor radiation levels, they can then identify hotspots, begin the decontamination process and direct members of their communities to begin reestablishing settlements when levels are deemed safe enough. 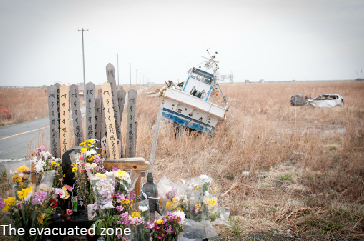 In April 2014, Kawano again ventured back to the evacuated zone. “We made the exact same route as we did in 2012. It’s pretty much exactly the same. Maybe the grass is taller, but the same destroyed buildings were there in the same condition. There are boats everywhere, and the same ones that were there two years ago are still there. Everything was literally unchanged because nobody has done any kind of rebuilding within the zone,” he explained. On his 2014 trip, Yoh brought a group of graduate students with him to Japan, which made the trip especially memorable. “The biggest difference was that, in 2012, our trip was very observatory. I was the witness to an event. This trip was also observatory, but I was able to observe the students’ reactions to what they were seeing. So there was a very human element that I didn’t experience the first time around … It was really profound. It was emotional. Just talking to them about their experience was very, you know…” he said, trailing off. Kawano continues to investigate the impact of social media on disaster management, and he believes his partnership with Niigata University will be life-long, since radiation will continue to be a problem for years to come. Kawano’s enthusiasm for his research in Japan is evident, and he encourages his students to find something they’re equally passionate about.